Not all power washing is the same. The high-pressure treatments used to clean wood and concrete can also damage it, leaving unsightly lines or pitting in fences, decks, and patios. Renew Crew of West Columbus uses a better, safer kind of power washing process – one that’s both eco-friendly and effective. Call Mike and Tracy Lear today at (614) 210-3998 for your free estimate! Rather than rely solely on pressure to remove built-up dirt and grime, Renew Crew of West Columbus uses a three-step power washing process – one that protects decks, fences, walkways, and patios as well as it cleans them. The first step is to apply a pre-soak foam. Unlike the cleaners used by most local pressure washing companies, ours is environmentally friendly; it won’t harm plants, animals, or outdoor surfaces. This foam penetrates outdoor surfaces to loosen tough dirt and grime. The second step is to apply a non-damaging, controlled-pressure power wash. Thanks to our pre-soaking, we can wash away dirt and grime without need for potentially-damaging water pressure. After our rinsing power wash, your fences, decks, patios, pavers, and other surfaces will look beautiful. The third step is what sets Renew Crew apart: After our power wash, we apply a sealant that protects wood and concrete from damage caused by rain, snow, wind, and sun; it also protects against mold and mildew. This step ensures that you’ll enjoy a longer-lasting clean. At Renew Crew, we offer more than the usual power washing: We provide comprehensive cleaning and protection loved by both homes and businesses. Our power washing service is available in Columbus, Dublin, Hilliard, Westerville, and nearby. Call today for a free estimate – and discover why Columbus trusts us to clean their fences, decks, patios, and more! Renew Crew of West Columbus is locally owned and operated by Mike and Tracy Lear. 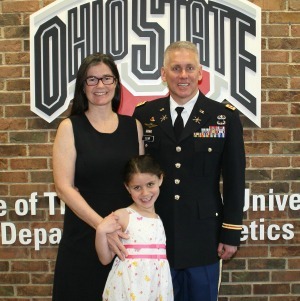 Mike was born and raised in Ohio and is a graduate of The Ohio State University; a career soldier, Mike served over 21 years in the US Army with deployments to Iraq and Afghanistan. Tracy was born and raised in Kansas City and graduated from the University of Missouri; a career educator, Tracy has taught elementary school children in Kansas City, North Carolina, and Ohio for over 20 years. In addition to local roots and community pride, our business benefits from the backing of Renew Crew – a national power washing service with the latest in deck, fence, walkway, and patio cleaning tools and techniques. We think you’ll agree: It’s a winning combination!